OPEN SKY CREATIVE SOCIETY - NEW WEBSITE! The Open Sky Creative Society is happy to present its new website and logo! Find out about thier upcoming summer festival, July 11th & 12th, 2015 and other events! The Yellowknife Choral Society is commissioning new Choral works for its choirs! Are you a singer/songwriter, composer or music arranger living in the NWT? If yes, this opportunity may be for you! Register Early for Culture Days 2015 and Win a Trip to the National Congress on Culture! Do you have a passion for culture? Have you organized a Culture Days activity in the past? It’s time to register your 2015 activity! Artists, cultural organizations, groups or community leaders, are invited to participate in Culture Days 2015. Searching for Tookoolito: Donations for a true northern story yet to be told! Lunch Pail Theatre is a not for profit dramatic arts guild whose goal is to provide quality theatre entertainment in Yellowknife. They are the people who have recently brought you such plays as Arsenic and Old Lace, and Harvey. They also bring you great one-act summer entertainment at Theatre on the Lake where they often feature local playwrights. As a guild, the members are the Lunch Pail Theatre Board and all members participate equally in the choice and selection the scripts and in their production. Artailer is an online-curated art marketplace. Everyday thousands of enthusiastic art lovers and collectors visit Artailer.ca seeking for Original Canadian artworks. Artailer gets you and your works in front of the target buyers. Outside of YK ARCC programming, the gallery space is available for rental to artist and cultural organizations that want to exhibit work. The gallery is available for workshopping, meeting, gathering and creating. The ARCC is currently recruiting volunteers and potential board members. If you are interested in taking on a more active role with ARCC or in the broader Yk arts community, this is a great way to do it. Email ykarcc@gmail.com to join or to get more info on these positions. Fort Smith’s Brandy Wilson received an incredible honor this February in London, England. She was 1 of 16 artists from around Canada who were chosen to have their visual art turned into a wool rug in Canada House, London. The revitalized Canada House serves as a showcase for Canadian art and design and features more than 200 pieces. 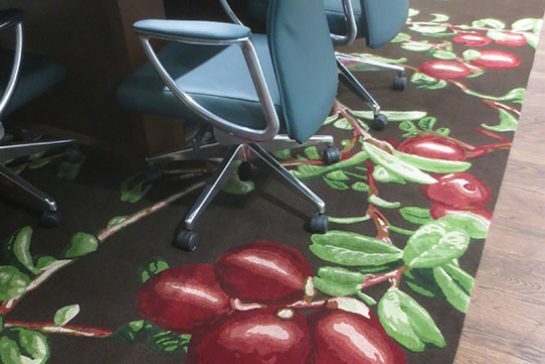 The chosen photo is an image of bog cranberries, which adorns the floor of the Northwest Territories meeting room. The Queen herself was one of many to view Brandy’s work. Set in 1956 and originally titled 12 ANGRY MEN, the play has been updated with a diverse cast of men and women set to deliberate on a murder case. There have been few changes to the powerful script and though some details have been updated — the basics of the story and characters are timeless. Tune up your guitars and warm up your vocal cords, in less than a month CBC Music presents Searchlight 2015 - The Hunt for Canada's Best New Artist. Last year, thousands of Canadian bands showcased their range of musical abilities, Lauren Mann & The Fairly Odd Folk took home the grand prize of a showcase at the CBC Music Festival and $20,000 in gear from Yamaha, and tons of other bands received radio play and national exposure that led to record deals, more radio play, coverage in newspapers and magazines, and tons of new fans. Need a warm place to paint? Want to hang out for a few hours on Saturday or Sunday and work on a project alongside other artists? Want to make a bit of pocket money while you discuss the finer points of modernism with your fellow artists? Looking for a unique and fun couples activity? Planning a trip to a Latin country and want to feel at ease dancing once you arrive? Interested in getting some good exercise and want to meet new people? If you have ever wanted to try your feet at salsa dancing, classes start again on January 12th and are now conveniently located downtown at the Top Knight! Great for people who have never danced before, learn the basics in a relaxed atmosphere and among friends at the Top Knight. The Long John Jamboree is seeking videographers and photographers for the 2015 festival. For details, please see attached PDFs. Artless Collective is looking for women between the (approximate) ages of 25-40 to audition for six spots in an upcoming video shoot. There are both speaking and non-speaking rolls to fill and they are looking for women of all ethnicities and backgrounds. OTTAWA, Dec. 10, 2014 /CNW/ - The $1 Million Arctic Inspiration Prize has been awarded to FOXY (Fostering Open eXpression among Youth), a community-based participatory action research project, for its knowledge to action plan to work with young women and men across the North to facilitate dialogue about sexual health issues, develop leadership and coping skills, and build greater self-confidence for making healthy life choices.